Being misguided after guided , being lost after saved, such is the consequences of calling another Muslim as Kafir/Mushrik/Abu Lahab/Satan/Grave worshiper etc! Abu Huraira reported Allah’s Messenger (may peace be upon him) as saying: Don’t nurse grudge and don’t bid him out for raising the price and don’t nurse aversion or enmity and don’t enter into a transaction when the others have entered into that transaction and be as fellow-brothers and servants of Allah. A Muslim is the brother of a Muslim. He neither oppresses him nor humiliates him nor looks down upon him. The piety is here, (and while saying so) he pointed towards his chest thrice. It is a serious evil for a Muslim that he should look down upon his brother Muslim. All things of a Muslim are inviolable for his brother in faith: his blood, his wealth and his honour. 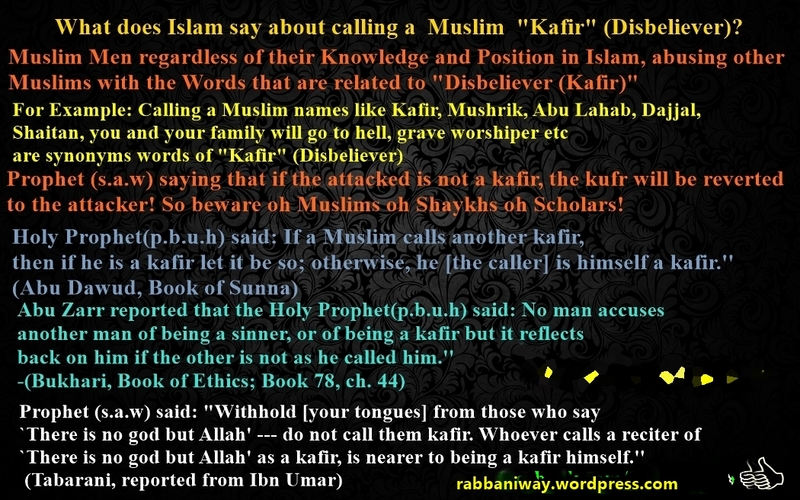 Prophet (s.a.w) saying that if the attacked is not a kafir, the kufr will be reverted to the attacker! So beware oh Muslims oh Shaykhs oh Scholars!